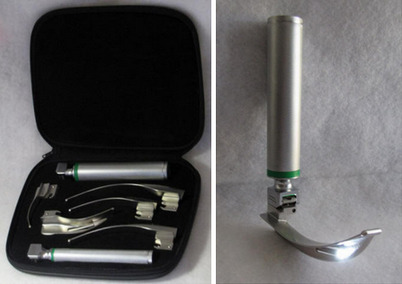 NEVER WORRY ABOUT A BURNED OUT BULB AGAIN WITH THIS AMAZING PROFESSIONAL LED LARYNGOSCOPE! 5 MacIntosh blades plus Both AA and C cell handles and protective Zippered Case. 3.5v Bright White Full Spectrum LED illumination to insure true tissue color for accurate identification of landmarks and trachea. Handle is color-coded green to signify compatibility with most major brands of fiberoptic blades. Complete with a protective case that surrounds and protects each instrument part with a soft foam lining. Fully compatible with ALL fiberoptic hook on blades that conform to ASTM (F965) and ISO (7376-1) Full Spectrum 3.5v Bright Whiteâ„¢ LED Light similar to daylight sun NO RISK GUARANTEE: We back this Laryngoscope with a LIFETIME WARRANTY that even includes the light source and a no questions asked 30 day money back guarantee.